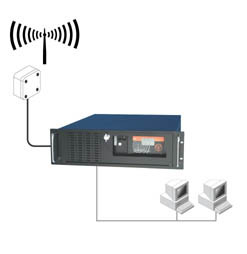 Connects directly to Ethernet, fits in a standard 19" rack, incorporates a Galleon ARC Computer Clock with remote antenna that can bepositioned up to 200m (600 ft) away with LED signal strength display for easy installation, an integral time display, serial interface,a NT workstation, Ethernet CAT5 connection, power supply and Time-Sync NTP network time server Software driver for uni-cast, broadcastor multi-cast time synchronization. Can process 10,000 NTP requests per minute. 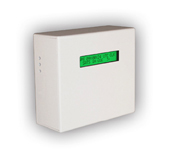 A simple to use NTP time server that receives accurate time from the atomic radio clock time signal (MSF) and using NTP can provide thissynchronised time via a Ethernet port to any computer, server, switch, etc that conforms to the Network Time Protocol V3. Can process 1,000NTP requests per minute. A simple to use NTP time server that receives accurate time from the a radio time signal (MSF) and using NTP can provide thissynchronised time via a Ethernet port to any computer, server, switch, etc that conforms to the Network Time Protocol V3. Can process 1,000NTP requests per minute. 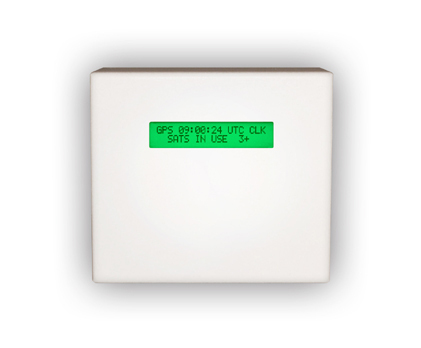 Connects directly to Ethernet, fits in a standard 19" rack, incorporates a Galleon GPS Clock, tracks up to 12 satellites, with remoteantenna that can be positioned up to 1,000 m (3,000 ft) away with LED signal strength display for easy installation, an integral time display,serial interface, Windows 2000 workstation, Ethernet CAT5 connection, power supply and Time-Sync NTP network time server Software driverfor uni-cast, broadcast or multi-cast time synchronization. Guaranteed to provide an accurate time signal anywhere in the World. Connects directly to Ethernet, fits in a standard 19" rack, incorporates a Galleon GPS Computer Clock, tracks up to 12 satellites,with remote antenna that can be positioned up to 1,000m (3,000 ft) away with LCD signal strength display for easy installation, an integraltime display, Ethernet CAT5 connection and Time-Sync NTP network time server Software driver for uni-cast, broadcast or multi-cast timesynchronization. Based on a LINUX platform. Conforms to Network Time Protocol Version 4 (NTP V4). A simple to use NTP time server that receives accurate time from the GPS satellites and using NTP can provide this synchronised timevia a Ethernet port to any computer, server, switch, etc that conforms to the Network Time Protocol V3. Can process 1,000 NTP requests perminute. A simple to use NTP time server that receives accurate time from the GPS satellites and using NTP can provide this synchronised timevia a Ethernet port to any computer, server, switch, etc that conforms to the Network Time Protocol V3. Can process 1,000 NTP requests per minute. Connects directly to Ethernet, fits in a standard 19" rack, incorporates a Galleon Atomic radio clock receiver and a Galleon GPS Clockwith twin displays showing signal strength for easy installation, an integral time display, serial interface, Windows 2000 workstation,Ethernet CAT5 connection, power supply and Time-Sync NTP network time server Software driver for uni-cast, broadcast or multi-cast timesynchronization.